I find myself in need of an engine dolly to hold a project engine. After all, just leaving it kicking around the shop floor is not the most practical for working on, plus, it tends to get in the way. After a little though, one thing lead to another and I thought, an engine dolly is just a heart beat away from an engine test stand, so why not go that little extra distance to a stand. Well, I took a look around to see what was out there and found all sorts of stands, some plans available, some manufactured (quality & expensive) and others mass produced (poorly built and less expensive). I found lots had great features, others were sadly lacking in important areas, and still others had nice features, but failed miserably in the execution. Ultimately, I could not find a stand that I felt had all the features that I wanted. Well, you know where this is leading to.. IT IS TIME TO BUILD AN ENGINE TEST STAND! While not all engine stands are created equal, they do all share the majority of their dimensions and features. After all, they all do the same job, hold essentially the same engines dictating that they all be approximately the same size and shape, have the same brackets, attachments and basic features. What sets one stand apart from another? In many cases, it is the quality of materials and components, the EXTRA features, method of adjustment and the implementation of those features the fit, finish and workmanship. First things first. I am using 2 x 2 x 3/16 inch wall square tubing. Why? Because I had it on hand from one of my trips to the scrap yard. Also, because going to 1/8 inch wall doesn’t build a strong enough stand in my opinion. For the basic frame, I will be using 2 – 48inch lengths for the main rails, and 3 – 28inch lengths for the cross rails, (yes 3, it is the colapsible part) which will also serve as the receivers for the telescoping caster legs. Why telescopic? Stability! Bolt a 500 pound engine into the stand with 4 or 500 horse and youll want a wide base or the engine will torq the stand and do the funky chicken all over the floor. Take two of the 28 inch cross rails, and drill completely through, on the center line at the 2, 10, 18and 24 inch marks as per the image using 3/8, 7/16 or ½ inch drill bit, depending what you have on hand or want to use for bolts or pins that will be used to secure the telescopic caster legs in position..If you DO NOT want telescopic legs, make the ends 36 inch instead of 28 so they will extend past the side rails by 4 inches on each side to mount the casters and do not drill. For those that have not done this sort of thing before, drill through a smaller pilot hole, about ½ the size of your desired diameter before drilling the larger hole. In my case, I drilled a ¼ inch pilot hole before drilling the desired ½ inch hole. After drilling the final hole size, chamfer (bevel) the hole to debur. I find a step drill works very nicely for this. Not only does this give you a cleaner finish, the bevel assists in alignment when inserting the bolts or pins. 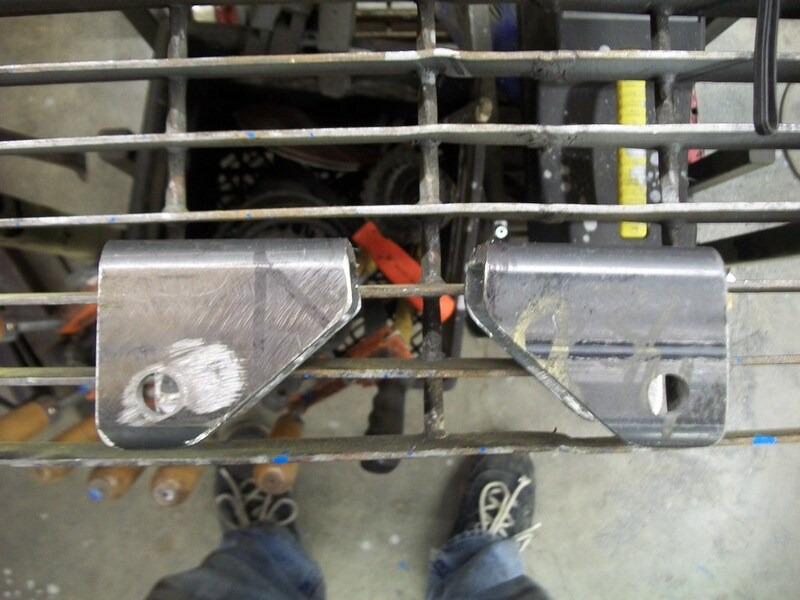 When positioning the frame rails for welding, overlap the rails by a ¼ inch both directions to provide exposure for the welding fillet, without burning back the edge. Square the frame carefully, and tack weld the joints, then check for square again and adjust as required. Keep a close eye on the square of the frame, and check after each weld to ensure no movement, warping or pulling has occurred. Peen all welds to relieve heat stress. This will help keep it square, as the heating cooling process shrinks the metal, pulling it out of position. Add a nice professional finishing touch by welding a cap on any frame ends that are not required to be open. The legs are made of a 16 inch lengths of 1 ½ x 1 ½ x 3/16 tubing. 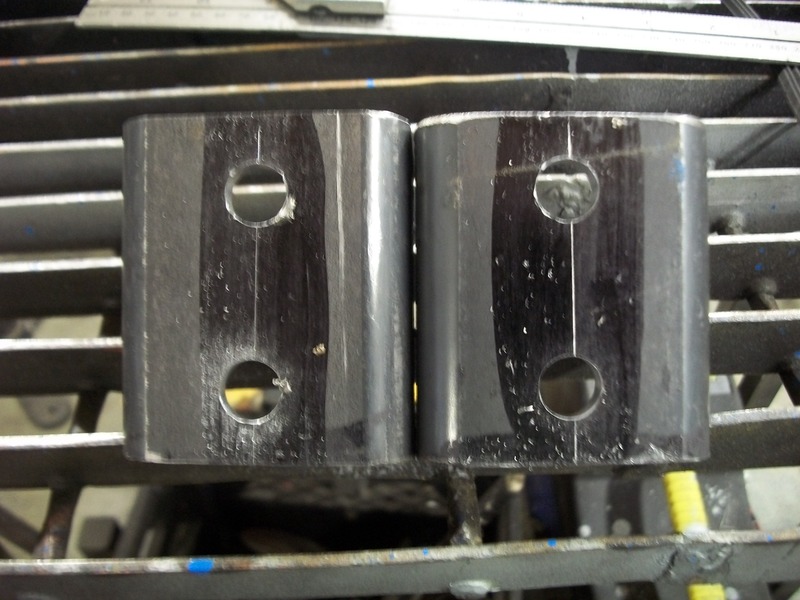 Holes are drilled through the centerline 2 ½ and 6 ½ from the end. This provides a total of three leg positions for maximum flexibility and stability. I am using 5 in. swivel casters, with a brake mechanism and a 400 lb capacity on each corner. Note that the overall height of the caster is about 7 ½ in. This will allow enough ground clearance for most floor hoists to move under the frame when mounting and removing engines from the stand. Do not cheap out on these. You have the weight of the engine, and the engine stand AND the additional load caused by the engine with some rev torque applied. I am using 3 x 4 x ¼ in. plates, drilled to match the pattern of the caster mounts to weld onto the telescopic legs. 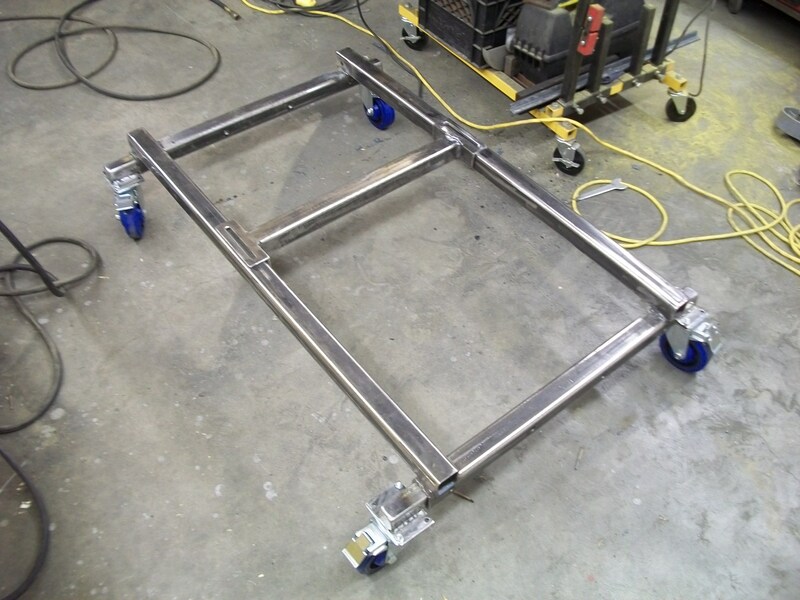 Some stands and plans use either a stud pin mount, or weld the caster directly to the frame. I do not think this provides a particularly professional appearance, and obviously, creates issues if you ever have to replace a caster. Finally, weld the caster mount plates to the ends of the telescopic legs. Notice that once again, the open tube ends have been capped off with a metal plate and ground smooth to provide a smooth professional finished appearance. I will electroplate these caster legs for a finishing touch, prior to final assembly. Here is a complete leg with caster, slipped into position in the frame. Next, you will need one or two sliding cross rails. One to attach the front engine mount uprights to, and another for the rear engine mount uprights if you want to be able to mount the rear of the engine with out a bell housing attached to the block. You will need 2 – 6 in. pieces of 2 x 2 x 1/4 angle iron, and a 23 in. piece of 2 x 2 x 3/16 square tube for each one. NOTE: The final dimension between the angle iron faces, varies with each unit based on the accuracy of your measurements and assembly. I suggest you use the assembled frame as a jig to position and tack weld this assembly. Aim for approximately 1/16th inch total gap between the angle brackets and the frame rails to allow easy movement. Drill 7/16 inch holes ¾ inch from the ends of the 2-6 inch pieces of angle. Note that these are NOT on the center line of the 2 angle. Due to the ¼ wall thickness of the angle, you must offset the centerline by a ¼ in order to align with the holes you drilled through the main frame rails. Any variation in the thickness or dimension of the materials being used will vary this offset. Pay attention, double check, and adjust as required to achieve alignment. Create an elongated slot in each bracket by cutting out the material between the drilled holes. I have used a piece of angle iron, clamped in position to act as a guide for the plasma cutter head. By using a guide for your cutter, it will give a fairly straight cut requiring minimal clean up to finish. A plasma cutter, cutting torch, or hack saw and cold chisel will all get the job done. As you can see by the cuts, I am a little out of practice. A little clean up and a fairly tidy slot is created allowing the brackets to slide easily on the beams with the bolts in place. Make sure to test the slots by sliding a 3/8 bolt along the slot during your finish work to ensure smooth and complete travel. I have positioned the components for the sliding cross beams into the frame, to ensure I have the items square, and fitting correctly before tack welding together. Again, ensure you have a slight gap between the slotted brackets and the main frame rails so that the cross beam slides without twisting or jamming. Remember, as always, peen your welds to control warping and pulling. All said and done, grind up the brackets, round off the corners and bevel the edges to create a tidy and smooth finish ready for painting. If you are going through the process as documented, you should be at about this stage now. Here we have a basic frame, with one of the two fabricated sliding cross rails in position, and the telescopic caster legs in position. 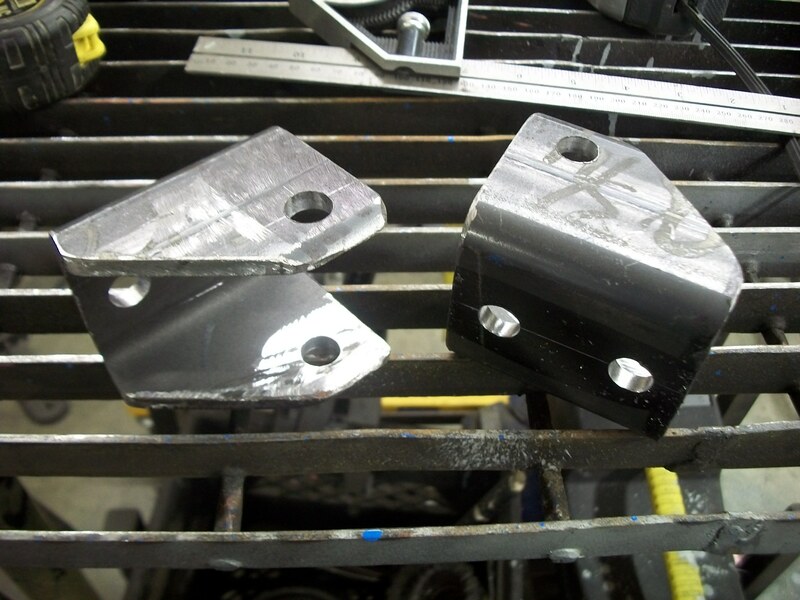 For the side engine mount uprights, you will need 4 – 6 x 5 x 1/8 plates.. Drill 3/8 in. holes, ¾ inch from the bottom, 4 inches apart, 1 inch from the edge as per image. Cut 45 deg angles, 2 inches off each top corner. Grind, bevel, round and clean up your edges and corners. It only takes a moment, drastically improves the appearance of your finished project, and will likely save you a cut or scrape down the road due to a jagged edge or sharp corner. For the uprights of the side mounts, you will need 2 – 16 inch lengths of 2 x 2 tubing. Drill a ½ inch hole through the top end of the front mount uprights as per spec. Cut off the corner at 45 deg Use a piece of ½ pipe cut to length to fit inside the tube. Align with the hole, insert ½ inch bolt through hole & pipe to hold the pipe in position and weld pipe in on the inside of tubing. Be care full not to burn through and weld the bolt in. When done and cooled, run a 1/2 drill bit through the pipe to clean it up. Round and debur all corners and edges. Jig the uprights using a piece of 2 x 2 tube to simulate the cross rail. Use 3/8 X 3 inch bolts and nuts to snug and align the mount plates onto the 2 x 2. Use thin card board, or 4-6 plys of paper between the plates, bolt shanks and the 2 X 2, to maintain a slight space. This ensures easy adjustment when mounted on the cross rail. Center, square and clamp an upright between the plates and butted up to the 2 X 2 and weld the upright to the plates. Peen all welds to relieve heat stress and warping as you go. These attach to the top of the side engine mount uprights to adapt the uprights to most engine mount requirements. If you have some special requirements, you will have to build adapters to suit your needs. These however, will take care of most engine side mounts. Using 2 1/2 x 2 1/2 x 1/4 inch square tubing. Cut off one corner of the sides at 45 deg. Roughly 1 1/2 inches on the square. It’s not that important as it’s mainly for visual effect. Cut the back side out of the angle so that you end up with a U shape, which will be 2 1/2 x 2 1/2, as you are only removing the 2 inches between the sides, not the entire back face. Drill 1/2 inch cross holes, through which the bolt will pass when attaching to the top of the front engine mount uprights. Lay out and drill two holes on the centerline of the face. These will be the ends for the slotted holes. This view makes it a little easier to see the relationship of all the holes, angles and cuts. 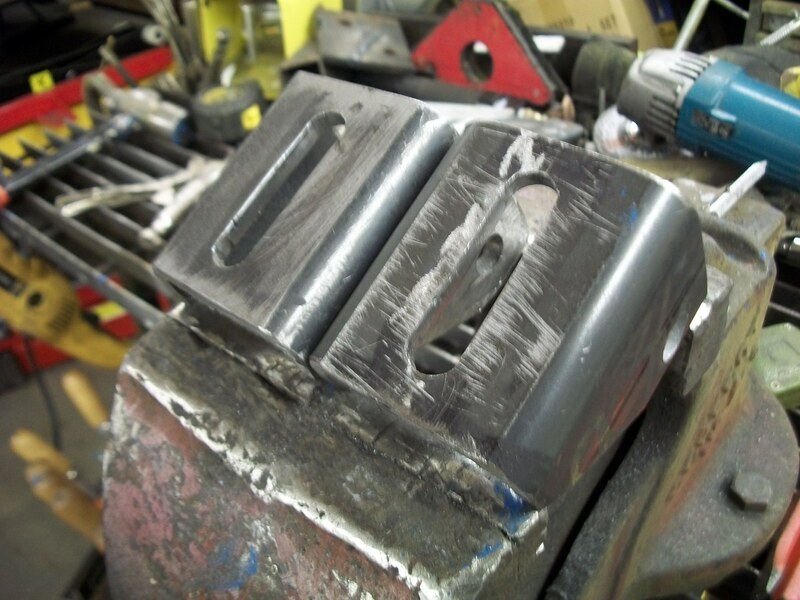 Cut out the slots and finish the edges using the same process as previously on the engine mount cross rail brackets. Here’s another view, final item, all slots cut, holes drilled, edges rounded etc. I will electroplate these before final assembly. It can be difficult to visualize how these adaptors fit into the final assembly and mount to the uprights. Here’s a picture of the final assembly, with the V12 race engine mounted up in the stand. In this case, due to the engine side of the motor mount being in place, and the V12 being fairly wide, the uprights are set to their widest position, and the mount adaptors have been flipped to give the widest stance in order to accomodate the engine. For the rear bell housing mount, we we start out building the bottom plates, which will be welded to the upright post, and bolts through the rear cross member of the base frame. We will use 2 – 12″ pieces of 6 x 1/4″ material for the brackets. I have cut 4 inches off both top corners, giving a 45 degree angle. This is primarily for apperance reasons. But, eliminating a pointed corner will usually result in a saved scraped shin.Lay out and drill 2 – 3/8 dia holes, 1 inch from the bottom, and 1 inch from the ends or 10 inches apart as per die image. As always, on completion, chamfer the holes, and round off the corners and edges. Next, we will build the upright for the rear mount, using a 30 inch length of 2x2x1/4 inch square tubing. If making do with what you have on hand, I would suggest a 28 inch length is a minimum. Using anything longer, perhaps up to 32 inches may be beneficial when the stand is in use, allowing the accessory platform to be slightly higher for a more functional working height depending on the individual.As per the image, on the centerline, lay out and drill 18 – 3/8 inch dia. holes 1 inch apart through the upright, starting 1 inch from the top. These holes will be used to adjust the rear bell housing mount up and down as required to fit the engine you are mounting.I also trimmed of the top corner of the upright, leaving it at an angle, primarily for apperances. Secure the plates on either side of the upper rear cross member of the base frame using 2 – 3 1/2 inch 3/8 inch bolts. While this bracket will not require ‘adjustment’, using a piece of thin cardboard (cereal box) or a few pieces of office paper to space the plates apart, will make assembly and disassembly of the stand easier.If the mounting holes in the frame, and the plates don’t align perfectly, secure one side, then run a drill through the holes together on the other side. Position the base of the upright between the secured mount plates, with the holes parallel to the plates and cross member. Leave a franction of an inch, between the bottom of the upright, and the top of the base frame cross member to ensure easy mounting and insertion of the bolts.Ensure the upright is square to the base, and tack weld. Check square again, and adjust as required. Only when correctly squared and firmly tac welded can you complete the welding of the upright to the mount plates. As always, pean your welds to prevent warping. On completion of the welding, you should have a result similar to this. 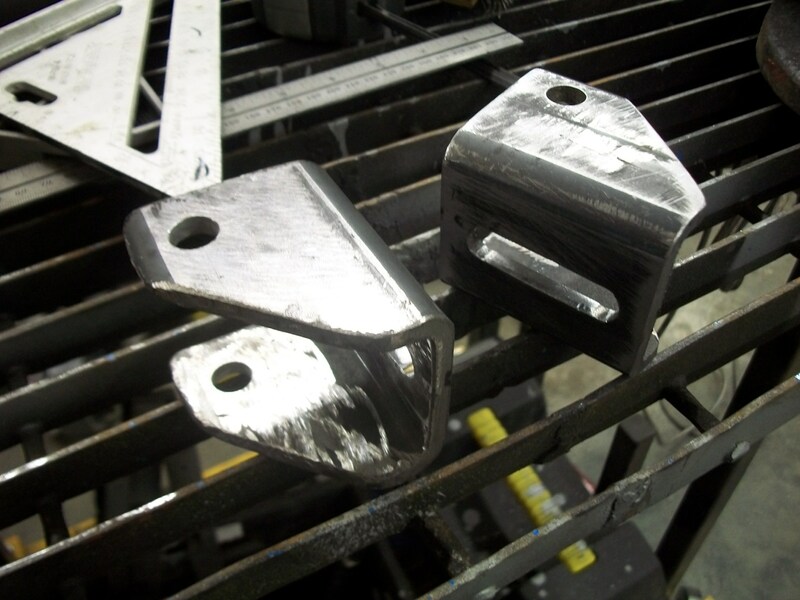 The first step in building the bell housing adapter is to build the brackes that will bolt through the rear mount upright, and allow for verticle adjustment of the adaptor to suit the engine being mounted.Cut 2 – 2″ lengths of 2x2x1/8 inch angle iron. This will result in two ‘L’ shaped pieces. Lay out and drill two 3/8 inch dia. holes on the centerline of the ‘L’, not across the ‘L’. Using the same technique as above, cut out the material between the holes to create 2 slotted holes to allow for adjustability of the brackets. More coming soon.. Stay Tuned.